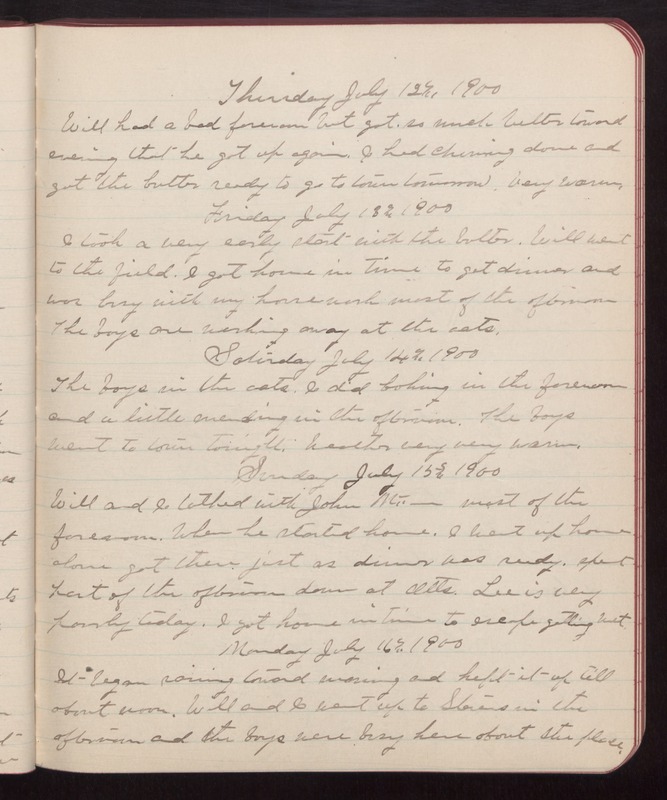 Thursday July 12th 1900 Will had a bad forenoon but got so much better toward evening that he got up again. I had churning done and got the butter ready to go to town tomorrow. Very warm. Friday July 13th 1900 I took a very early start with the butter. Will went to the field. I got home in time to get dinner and was busy with my house-work most of the afternoon The boys are working away at the oats. Saturday July 14th 1900 The boys in the oats. I did baking in the forenoon and a little mending in the afternoon. The boys went to town tonight. Weather very very warm. Sunday July 15th 1900 Will and I talked with John Mc. most of the forenoon. When he started home, I went up home alone got there just as dinner was ready. spent part of the afternoon down at Otts. Lee is very poorly today. I got home in time to escape getting wet. Monday July 16th 1900 It began raining toward morning and kept it up till about noon. Will and I went up to Stevens in the afternoon and the boys were busy here about the place.